Several studies addressed the auroral generator by using analytical (e. g. Rostoker and Boström, 1976), semianalytical (e. g. Lysak, 1985; Vogt et al., 1999), and numerical tools (e. g. Birn et al., 1996; Birn and Hesse, 1996). 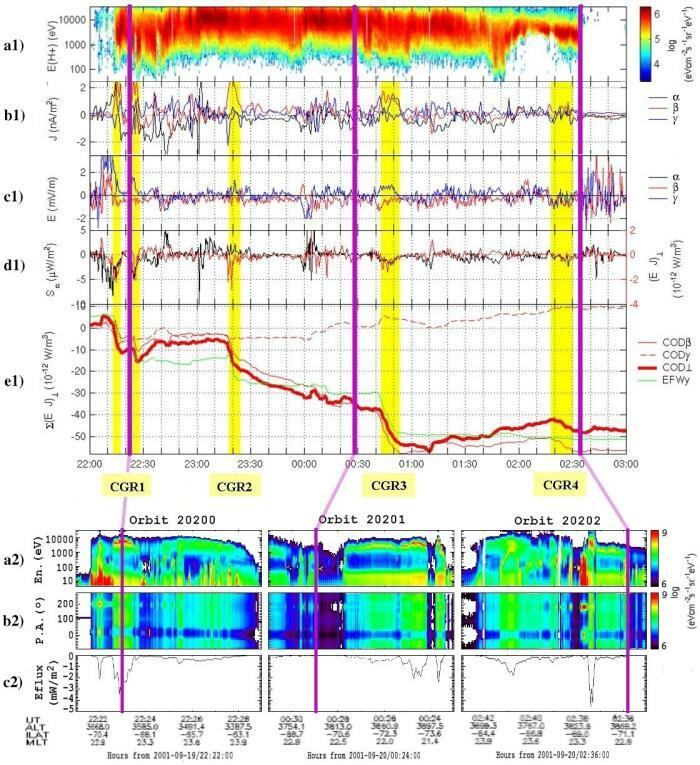 The examination of conjugate nightside data from the Cluster spacecraft (in the plasma sheet, at 18RE) and FAST satellite (below the Auroral Acceleration Region, at 0.6RE) allows the investigation of auroral generator regions by experimental means. Because the Cluster mission (Escoubet et al., 2001) consists of four identical satellites in tetrahedral configuration, the complete determination of the current density, J, becomes possible, by using magnetic field data from the FGM experiment (Balogh et al., 2001). In addition, each satellite is equipped with three instruments EFW (Gustafsson et al., 2001), EDI (Paschmann et al., 2001), and CIS (R`eme et al., 2001) able to measure or infer the electric field, E. At the same time FAST offers an instantaneous view over the auroral electron precipitation and energy flux into the ionosphere, which helps to validate the generator signatures seen by Cluster. By analysing 5h of Cluster data (top plot of Fig. 1) Marghitu et al. (2006) and Hamrin et al. (2006) identified four Concentrated Generator Regions (CGRs), where mechanical energy is converted into electromagnetic energy, E � J < 0. The CGRs were located in the plasma sheet boundary layer (panel (a) Cluster), where electric fields are associated with plasma motion, caused by the dynamics of the plasma-sheet / lobe interface, while electrical currents are induced by pressure gradients. In three cases, when conjugate FAST data were available (bottom plots of Fig. 1), the CGRs were found to correlate with auroral electron precipitation near the polar cap boundary (panel (a) FAST). The current (b) obtained from magnetic field data by the Curlometer method (Dunlop et al., 2002) and the electric field (c) derived from CIS/CODIF proton data are used to compute E� J (d, red curve). The CGRs (yellow bands) are better visible in panel (e), as sharp gradients in the cumulative sum of E � J. Panel (e) exhibits also a good agreement between the CIS/CODIF and EFW results and indicates that most of E � J is contributed by EyJy. The Poynting flux (d, black curve) is directed to the Earth during all CGRs except for CGR 2 and, when mapped to ionosphere, is comparable to the energy flux of the precipitating electrons (panel (c) FAST). The small scale structure of the electron precipitation is, in its turn, comparable to the mapped size of the CGRs. Figure 1: Top: Cluster data for September 19 20, 2001. The data are smoothed and the variations faster than 24s removed. (a) CIS/CODIF proton energy spectrogram for s/c 1. (b) Components of the current density in a reference system, MAG, aligned with the magnetic field ( k B) and close to GSE ( ' x, ' y, and ' z). (c) Components of the electric field as derived from CIS/CODIF data, averaged over spacecraft. (d) Power density (red) and Poynting flux (black) averaged over spacecraft. (e) Cumulative sum of the power density computed by using CIS/CODIF (red) and EFW (green) data. The thin red lines show the contributions to the cumulative sum from the perpendicular components in the MAG system, E J (solid) and E J (dashed). EFW data normal to the spacecraft spin plane (close to the GSE z direction) are not available. The concentrated generator regions CGR1 CRGR4 are indicated with yellow bands. The conjunctions with FAST are shown with vertical magenta lines. Bottom: FAST data for three conjunctions with Cluster, at 22:23 UT, 00:29 UT, and 02:36 UT. (a, b) Energy and pitch-angle spectrograms. (c) Energy flux at the satellite level (negative is anti-parallel to the magnetic field and downward in the southern hemisphere). In the plots for the second and third conjunctions the time runs from right to left, in order to emphasize the correlation between the CGRs detected by Cluster and the energetic electrons measured by FAST (assuming the temporal variability is reduced). Balogh, A., et al., The Cluster Magnetic Field Investigation: Overview of in-flight performance and initial results, Ann. Geophys., 19, 1207 1217, 2001. Birn, J., and M. Hesse, Details of current disruption and diversion in simulations of magnetotail dynamics, J. Geophys. Res., 101, 15,345 15,358, 1996. Birn, J., M. Hesse, and K. Schindler, MHD simulations of magnetotail dynamics, J. Geophys. Res., 101, 12,939 12,954, 1996. Dunlop, M., A. Balogh, K.-H. Glassmeier, and P. Robert, Four-point Cluster application of magnetic field analysis tools: The Curlometer, J. Geophys. Res., 107, 1384, doi:10.1029/2001JA005,088, 2002. Escoubet, C., M. Fehringer, and M. Goldstein, The Cluster mission, Ann. Geophys., 19, 1197 1200, 2001. Gustafsson, G., et al., First results of electric field and density observations by Cluster EFW based on initial months of operation, Ann. Geophys., 19, 1219 1240, 2001. Hamrin, M., et al., Observations of concentrated generator regions in the nightside magnetosphere by Cluster/FAST conjunctions, Ann. Geophys., 24, 637 649, 2006. Lysak, R., Auroral electrodynamics with current and voltage generators, J. Geophys. Res., 90, 4178 4190, 1985. Marghitu, O., et al., Experimental investigation of the auroral generator with conjugated Cluster and FAST data, Ann. Geophys., 24, 619 635, 2006. Paschmann, G., et al., The Electron Drift Instrument on Cluster: Overview of first results, Ann. Geophys., 19, 1273 1288, 2001. R`eme, H., et al., First multispacecraft ion measurements in and near the Earth s magnetosphere with the identical Cluster ion spectrometry (CIS) experiment, Ann. Geophys., 19, 1303 1354, 2001. Rostoker, G., and R. Bostr�om, A mechanism for driving the gross Birkeland current configuration in the auroral oval, J. Geophys. Res., 81, 235 244, 1976. Vogt, J., G. Haerendel, and K.-H. Glassmeier, A model for the reflection of Alfv�en waves at the source region of the Birkeland current system: The tau generator, J. Geophys. Res., 104, 269 278, 1999.